Pushback pallet rack systems can store product 2 to 5 pallets deep. Pushback pallet rack is a Last In First Out storage system (LIFO). It is a more versatile LIFO storage system than drive-in rack because each lane in each level is always accessible. When the leading pallet is removed the trailing pallets move forward toward the pick aisle. If you are looking for Pushback Rack in Chicago, Illinois, or the Mid-West states, CSI is the logical choice. We strongly recommend Konstant and Steel King as exceptional Pushback Rack manufacturers. We have quick access to Pushback Rack equipment thru those manufacturers. If you have standardized on another manufacturer's pushback rack product, we are confident that we can source their product as well. CSI provides pushback pallet rack for high density last in first out storage applications (LIFO) where selectivity remains important. IF YOU DO NOT SEE SPECIFICALLY WHAT YOU ARE LOOKING FOR, Contact us. We offer a wide variety of options, including depths (number of carts), style of carts for unique pallets, reinforced posts, seismic designs, and more. 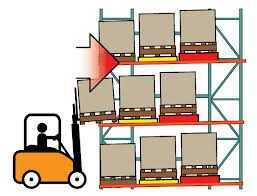 If it is determined that pushback pallet rack will not assist in achieving your objective we have many forms of pallet storage for many different objectives and environments: Selective Racks, Flow Racks, Cantilever Racks, and more.